I have been a bit quiet lately, and for good reason. On February 13th, I had my 20-week ultrasound. Things did not go as expected and I was referred to a Perinatologist/MFM for an ultrasound on February 22nd. I’ve been blogging about this, but have been marking those posts as ‘private’ because I didn’t want to concern anyone over something that could end up being nothing, and I wanted to hold this close to my heart until we knew what was going on. I wanted to capture all of the things I was thinking during this time, but didn’t want to share those things until we knew what we were dealing with. Very few people know about this – we didn’t even tell our parents for various reasons. It just seemed unnecessary to cause worry for others over something that was so unknown at the time. We now have a resolution to the situation, which is good. And the resolution is the best it could have been! Because we have a resolution, I have now made these posts from the last nine days ‘public’ and you can view them if you’d like. I’m so glad this little chapter of this pregnancy is behind us! Here is Wilson, looking cute and HEALTHY! Categories: Bryson, Perinatal | Permalink. We had our ultrasound today at 1:00. It was originally scheduled for 8:00 AM, but the clinic called yesterday to reschedule due to a monster snow storm that was expected overnight. Said snow storm was minor (oh so minor) but the timing worked out well for us and I liked being able to get up this morning to move at my own pace (slow!) and have both breakfast and lunch with my boys. I woke up feeling good about this scan. I just figured that we would be told it was nothing, and the worst case scenario would be that we’d have something to fix once Wilson was born. My head wasn’t clouded much this morning and I reminded myself that of all the people in the waiting room, I would likely be the one with the least amount to worry about. The ultrasound was great – the gal was very gentle and the machine was amazing. We have never seen such clear pictures in-utero. I knew what they were looking for, so I was relaxed until they got to his stomach. And… it’s gone. Whatever they saw last week is not there. The tech thought that maybe his gallbladder was in the way last time, at a strange angle, and appeared attached to the stomach. But, as she said, that’s just speculation on her part since she couldn’t see anything abnormal. This is going to sound weird, but we enjoyed this ultrasound. The tech was the age of our mothers, and very gentle and caring. She described every last thing she was doing and looking at, something that no one has done for us before. I just felt like there were no secrets at all, and I felt so comfortable that when she got to his stomach, I asked if she could see the “thing.” I knew she may tell me that she couldn’t answer that, but I thought she was the type to share what she was seeing. And she did. She saw nothing. When she got to Wilson’s head, she tried really hard to get a 3-D photo and she did! She told us how cute he is. How nice is that? I will always hold a special place in my heart for Dr. W! So – that’s it. Nine days later, all is well. All is resolved. All is just fine! Saturday morning was a bit rough. My dear friend who photographed Matthew’s birth emailed me about Wilson’s birth, concerned that she may miss it if he comes early. I hadn’t told D yet about the ultrasound because I just didn’t want to worry her – and – I didn’t want to talk about it. It was still too fresh last week. I emailed her back, explaining that there may be a problem and that it could throw a wrench into my birth plan, so let’s discuss birth photography after the appointment with the specialist. As I wrote that email, I started feeling nauseous – just like I did when Dr. H first told me about his concerns. I started to cry and had to type through the tears to finish the email. I spent the rest of the morning worried. I finally admitted my worry to B later that night when we were discussing names for Wilson. I told him how writing about the ultrasound made me feel like I was going to throw up at any moment. I told him that I can’t keep having mornings, or days, or even moments like that. Since then, I have not. Having Matthew (a very active and newly headstrong toddler) around takes all focus off of everything going on around me. He is a fabulous distraction. He is a HAPPY distraction, and that’s what I need right now. I can’t spend time worrying about Wilson because all that’s going to do is make me sick and worthless – and I’m not being dramatic. As I posted last week, the day after hearing the findings was a totally wasted day. I didn’t even shower. I didn’t take care of myself. I ate like crap. I can’t be worthless right now, and I haven’t been since Saturday morning. I feel better about myself and about Wilson. This isn’t to say that I don’t think about Wilson and what may be going on – I just don’t get bogged down in it. When I feel him move first thing in the morning, I smile and say hello instead of worry. If he doesn’t move for a bit, I mess with him and make him say hello – and then I laugh. I no longer think, “what’s going on with you, little man?” I just enjoy him. I have 2 more days until we hopefully find out what’s going on. The way I live my life is to count down how many more full days I have left until something good, or something dreaded, is to occur. This is my optimistic side running my life and thoughts. Once I wake up for the day, I feel like that day is over (because let’s face it, waking up is the hardest part of the day for me!). HA! So – it is now Tuesday, which means that when I woke up today, I only had 2 days left (in my own warped sense of time) until we hopefully learn how Wilson is doing. That’s not a lot of time. Friday will be here before I know it – and I can’t wait. I’m not excited about the appointment, but I’m ready to know what we are (or aren’t, hopefully) facing. I’m ready to move on with a plan. No matter what is found (or not found) on Friday, there will need to be a plan for Wilson’s birth day. If the mysterious “thing” has disappeared, or is deemed to be of no concern, there will still be an ultrasound the day of his birth to rule out any possible issues. We have decided that already for ourselves. If the mysterious “thing” appears to be something that needs to be dealt with, then I want that plan solidified and put in place. NOW. Two more days… two more days. Today was a normal day. I woke up before Matthew, which is always nice, thought about Wilson, and smiled because he was up too. I didn’t worry about him. I just layed there and enjoyed feeling him say hello. I’ve felt much better about things in the last 24 hours. I let a day, full of potential, get away from me yesterday due to worry and concern. I know that worrying is normal, but I have a toddler to interact with all day and he deserves a mother who is focused on him. He deserves these final months of being my sole focus, because things are going to change at the end of June. I hate the idea of ruining even a single day with him due to worry. We spent the morning having fun, watching CG, snuggling in bed with milk and bananas, and showering. I didn’t shower yesterday (I wonder why) and we both missed that – playing in the shower with the bubbles and bottles of soap is one of Matthew’s favorite things to do. He LOVES standing under the water and letting it beat down on his head. I’m so glad we made time for that today! We took our sweet time and we both enjoyed the relaxation! Vera, Matthew’s girlfriend, came up for a play date. They had a ball. I swear, that girl could beat him to a pulp and he’d laugh through the whole ordeal! She is the sweetest thing to him too – kisses and hugs him like crazy. It’s too cute! I’m so glad we had her up – having her here made things feel normal again too! Yesterday was just too much. We stayed busy, but there was such negativity hanging over me. I wasted time, I sat around doing almost nothing after Matthew went to bed – and stayed up too late doing nothing. I didn’t even watch TV. I didn’t clean up the house. I didn’t put toys away (something we insist on nightly). I didn’t do the dishes from earlier in the day. I didn’t fold the laundry or wash more. I didn’t enjoy myself. And that’s sad to me. I need to try to enjoy myself when I have these random nights when B is away. Everyone needs “me time,” and I totally wasted it. Today is different. We got up, we enjoyed the morning, we hosted a play date, we went to lunch, Matthew took a STELLAR nap (almost 3 hours! ), I did laundry, I skyped with one of my besties, I picked up the house, I framed Matthew’s first b-day photo (so cute! ), I washed all of Matthew’s dishes (even the ones from lunch), and I did not worry about Wilson. Wilson is going to be OK. I have no doubts. I need to let him rest and enjoy a peaceful mother, because things may not be this peaceful when he’s on the outside! I woke up around 3:30 needing to use the restroom. My first thought when I woke up was that I really wanted a DQ Blizzard (that’s been on my mind since starting Whole30!). The immediate next thought was, “ah.. ultrasound. Wilson, are you there?” He was 🙂 I couldn’t sleep then for another hour or so, and just tossed and turned, and thought and thought. I should have said yesterday that I’m not worried that Wilson will die. I’m worried what his first days and/or weeks could be like if this “thing” ends up being something that needs to be addressed. I worry about being able to hold him, and nurse him, and just do the things that you do with a newborn baby. I know we’re not there yet in terms of needing to plan those things out, but I can’t get them out of my head. Especially at 3:30 in the morning. Matthew has been a GREAT sleeper these last two weeks and let me sleep until 7:15. I am so grateful! We got up and had a fun morning. We went to see my cousin (our guardian for our kids if something bad would happen to us), her two girls, and her niece (who is 5 days older than Matthew). It was a great time and Matthew had a ball! This gathering was pre-planned earlier this week, but it REALLY worked out in my favor given what’s going on (or not going on) with Wilson. My cousin is a non-practicing doctor. She’s a smart gal. And she’s married to a radiologist. I wasn’t even fully in the house before I was talking about yesterday, the ultrasound, and Wilson. She listened and then said that I shouldn’t freak out, but that she knows it’s scary. She asked what they know so far and I basically said, “nothing.” She asked if they speculated and I told her that they really didn’t but that the word, “cyst,” came up a few times. She asked if it was fluid-filled, air-filled, and if it had any solid debris in it. What Dr. H had told me was that it was fluid or air-filled, and that there was no visible debris at all (which is good). All of this made my cousin relax a bit. That, then, helped me relax. She asked if a radiologist had read the scans and I said I didn’t think so, but was wondering if her husband could. He can, but she says it’s better for him to be in the room, reading it as it’s happening. She asked where I was going for the next scan and she was happy with the doctor I’ll be seeing. She said that after that scan, that her husband could read the scans if I wanted. And that if I want him to do a scan, to just ask. So that was great. I feel better. I knew she would make me feel better. She always makes me feel better. Our day went on as normal. Sure, I’m a little down, but Matthew keeps me on my toes and HAPPY. Man alive, he keeps me happy! I had a text exchange with my cousin late tonight. She told her husband about Wilson’s “thing” and he has never heard or seen anything like what I’m describing. So that makes me a bit nervous, but on the flip-side, it makes me a bit upbeat because if it was something awful, surely it’s been seen before. Right? I’m choosing to believe that this is a good thing. And tomorrow is another day, yet again. I had Wilson’s anatomy scan today (“Wilson” is the name we’re trying out for BB2). B was out-of-town at an unavoidable meeting. Dr. H tried so hard to move the scan so he could be there, but we were pushing up against the end of the anatomy scan window, so I had to go alone. After our elective gender scan 3.5 weeks ago, I had no concerns. I skipped right on in when I was called back. I can feel Wilson moving a lot now, so I don’t worry about finding a heartbeat anymore during ultrasounds, which is nice. Not the scan to go alone to. During the scan, the tech spent a LOT of time on Wilson’s stomach. You know how you just know when something seems off? That’s how I felt. She kept measuring this black circle, over and over and over again. I knew not to ask her what she was doing. She seemed rather serious. Red flag #1. I also noticed that when she measured most things, she’d label them on the screen. She was not labeling the black “thing.” Red flag #2. 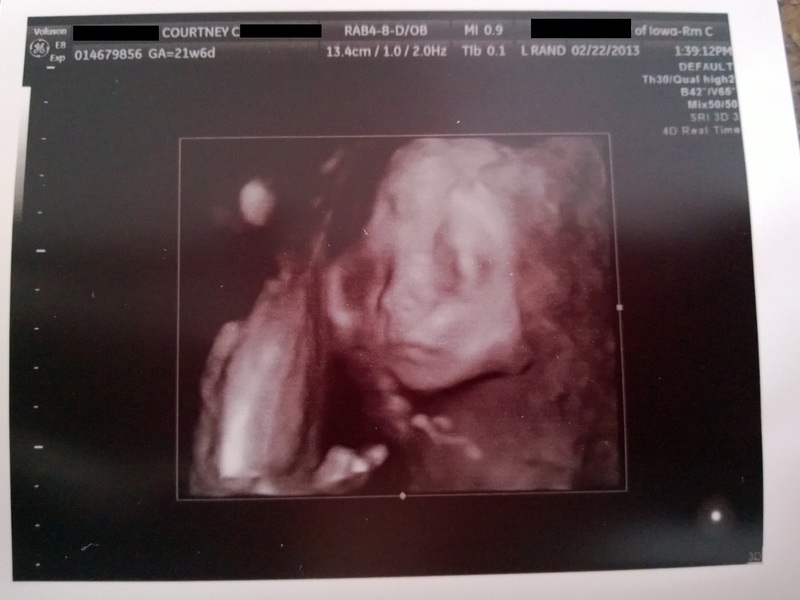 And finally, at the end after not a single attempt at a 3D scan, I asked, “no 3D picture today?” She seemed startled and said that she could try again and quickly said, “the placenta is too close to his face, so I can’t get it.” Red flag #3. I went out to the waiting room and waited for Dr. H’s nurse to call me back. She was her normal cheery self, so I forgot all about the red flags. That’s how I work – just distract me, please! We chatted about her impending move out-of-state and her fiancée’s residency. We discussed my second trimester screening results (all good!) and my blood pressure. Etc. etc. etc. She left to get Dr. H.
He then went on to say that there was an anomaly on Wilson’s stomach. I told him I knew that from how the scan went. He was a bit surprised, but then not so surprised. He showed me that pesky little black circle that the tech kept measuring over and over again. What is it? Well, they don’t know. They have no idea. It could be nothing, it could be something. I was immediately booked with a perinatologist (MHM) for next Friday (9 long days from now). That’s the soonest they can get me in due to their overwhelming practice. I kept it together rather well. I teared up here and there, but never cried. Dr. H said that it’s not something to freak out about, but that he would be worried if it was his kid. That’s why I love this man – he is so down-to-earth and REAL. As we talked it through, I started getting concerned. “So, if it is something, we’ll just fix it after he’s born, right?” Well, not necessarily. That made me almost cry. He said again that we have no idea what it is, but that some things aren’t fixable. But he hopes this is nothing and if it’s something, that we can fix it. He also said that by the time I see the peri next week, it could be gone. That would be nice. I then made the mistake of asking how big it is. Almost tears again. This “thing” is almost half the size of Wilson’s stomach. That concerns me. A lot. Dr. H knows how my mind works and mentioned that they rarely see cancer in newborns. What what what? My mind hadn’t even gone there (yet). I’m sure it would have, while home alone, so it was good of Dr. H to say that he didn’t think that was a concern. So I asked what it looks like. A cyst-type thing, but they really have no idea. Dr. H and I talked about the fact that everything else checked out just fine, and that the “catastrophic” things they look for aren’t there. He stressed again that this thing could be gone by next week. We then talked about the appointment in a week. Dr. H said that Dr. W sees the “worst of the worst” and the folks in his practice have built up some pretty tough exteriors. To that, I said, “so I won’t expect them to be all nice like you guys here.” Precisely. He said that Dr. W will meet with us right after the scan with a diagnosis and/or next steps. I started to tear up again. I got myself together so that I wouldn’t be the woman walking out of the OB who scares the hell out of everyone in the waiting room. I wasn’t even out the door of the building before texting B. “You need to step out right now.” He called me not even one minute later. I fell apart. I sobbed in the parking lot, I sobbed in the car. B sounded stunned and worried. I can’t imagine being him, making that call, and the first thing he hears is, “there may be a problem.” We talked it through and he sounded more and more concerned, and was very upset that I was so upset and alone. I went to pick Matthew up at the neighbors’ and I could not get there soon enough. I drove as fast as I could to get to him. I just needed to be with him. Bless his little heart, he came running to me and gave me a huge hug. I cried on his little shoulder. I told my neighbor about it and she comforted me. And then I collected my boy and drove home. Thank god for him. He kept me distracted until lunch with a good friend, and she took over from there. After lunch, I brought Matthew home and it took everything in me to put him down for a nap. I just wanted to keep holding him. I wanted to keep rocking him. I wanted to keep smelling his hair and feeling his breath on my cheek as he dozed off. I don’t think I wanted to be alone. I got a lot more hugs from Matthew throughout the day as I easily resisted bing-ing (because we don’t go.ogle anything in this house) what we saw on the scan. I won’t research this. There’s no need – it will only scare and upset me. I called my little sister to tell her, since I talk to her almost every day and not telling her would be lying. I advised her that I am not telling my parents because I can’t take their unwanted advice, drama, and research on the situation. Until there’s something to know, there’s nothing to tell. And right now, there’s nothing to know. B came home early from his trip and asked if we could try to go to the university hospital sooner for the scan. I told him that I like the timing – that a week gives it time to grow, or shrink, or – hopefully – disappear. If we could get the scan this week, they’d just tell us to come back in a week or so anyway. I’m good with the timing and he seems to be too. My mind has already gone in certain directions. I told B that I want Wilson formally named before the scan on Friday. I want him to be a “whole person” before we get the verdict. He agrees, but rubbed my shoulder and said, “he already is a whole person.” That was the perfect thing to say at that very moment. I needed to hear that. We’ve also decided that his birth, no matter how this thing turns out, will be our event only. There will be no one waiting in the waiting room as we deliver, as both sets of our parents did last time. We will need to discuss birth plans with our doctors and sort out when we can nurse him, if and when he’ll go for a scan to check the “thing,” and if and how they’ll treat the “thing” if it’s still there when he’s born. Even if this thing disappears before he’s born, I still want an ultrasound almost immediately after he’s born just to be sure we’re in the clear. The only people who will be meeting Wilson right away are his mom, dad, and big brother. So – there it is. My 20 week scan was far from perfect. It started well with a cooperative baby and quickly became a bit concerning. It went from being a bit concerning to being altogether terrifying. We won’t know anything for over a week. Categories: Bryson, OB, Perinatal | Permalink.